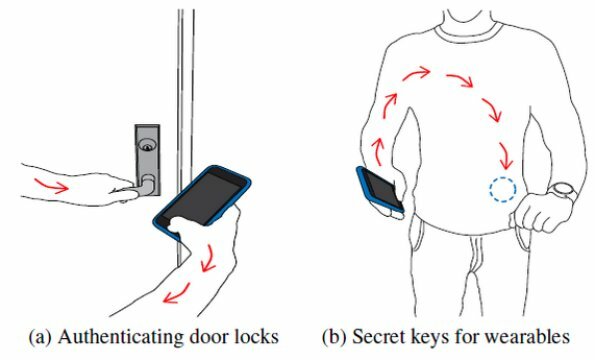 This new technique, which leverages the signals already generated by fingerprint sensors on smartphones and laptop touchpads to transmit data in new ways, is described in a paper presented in September at the 2016 Association for Computing Machinery’s International Joint Conference on Pervasive and Ubiquitous Computing (UbiComp 2016) in Germany. The research team tested the technique on iPhone and other fingerprint sensors, as well as Lenovo laptop trackpads and the Adafruit capacitive touchpad. In tests with 10 different subjects, they were able to generate usable on-body transmissions on people of different heights, weights and body types. The system also worked when subjects were in motion — including while they walked and moved their arms. The team achieved bit rates of 50 bits per second on laptop touchpads and 25 bits per second with fingerprint sensors — fast enough to send a simple password or numerical code through the body and to a receiver within seconds. Web Source: University of Washington. Original written by Jennifer Langston.